The Windsor Agricultural Society received the Event Legacy Award for its 251st Hants County Exhibition. This award was presented in recognition of an annual community festival or event providing long lasting benefits to a community in the Annapolis Valley. The awards luncheon featuring several individual and group awards was hosted by the Annapolis Valley Event and Sports Tourism Association (AVESTA) and the Annapolis Valley Chamber of Commerce . This year’s Event Legacy Award was sponsored and presented by the Municipality of the County of Kings. 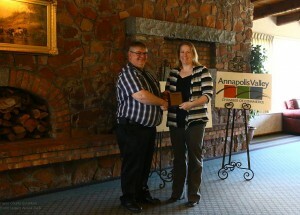 Receiving the award on behalf of the Windsor Agricultural Society is director Cynthia Duey. CTV Atlantic First at Five news story on the opening of the oldest agricultural fair in North America – celebrating 250 years. 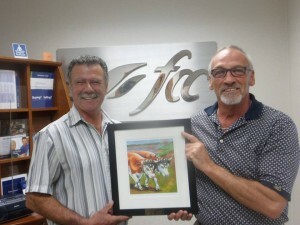 Windsor Agricultural Society President Brian Casey presented a 250th Anniversary Art Print by Susan Sweet to Rick O’Regan of Farm Credit Canada in appreciation of their sponsorship at our 250th Anniversary Celebration at the Hants County Exhibition. Windso r Agricultural Society President Brian Casey presented Ed Patton of Green Diamond Equipment a 250th Art Print by Susan Sweet in appreciation for their sponsorship of our 250 Anniversary Celebration. Also shown in the photo Jeff Griffin – Green Diamond. 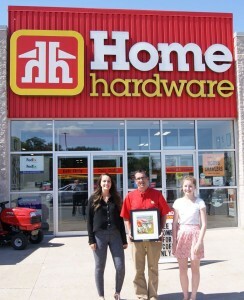 Summer Students Brooke McNeil and Leah Newcombe present Windsor Home Hardware owner Jeff Redden with a token of the Hants County Exhibitions appreciation for the generous sponsorship provided to the Ex for their 250th Anniversary Celebration. The gift is a 250th Art Print by Susan Sweet. 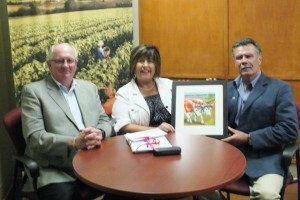 Windsor Agricultural Director Bruce Saunders (left) helps present Scotiabank Manager Wendy Brown with a token of the Society’s appreciation for the bank’s sponsorship of the 250th Anniversary Celebration at the Hants County Exhibition. 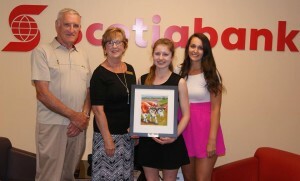 Also shown in the photo are Summer Students Brooke McNeil and Leah Newcombe (far right). Wendy was presented a 250th Art Print by Susan Sweet. 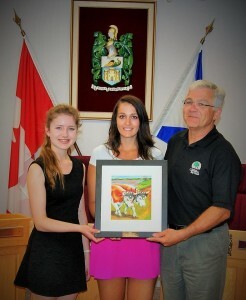 Hants County Exhibition Summer Worker’s Brooke McNeil (left) and Leah Newcombe (center) make a presentation of the 250th Art Print by Susan Sweet to Windsor Mayor Paul Beazley (right) in appreciation of the Town’s sponsorship of the Exhibition’s 250th Anniversary. — with Brooke McNeil, Kendra Bishop and Paul Beazley. 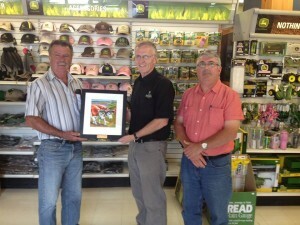 Windsor Agricultural Society Director Bruce Saunders (left) and Society President Brian Casey (right) present Bob Wilson (center), with a token of the Societies appreciation for Kings Mutuall’s donation to the celebration of the 250th Anniversary of the Hants County Exhibition. Warden Dauphinee and CAO, Cathie Osborne presenting a cheque as a donation for $25,000 to Brian Casey of Caseydale Farms for the Hants County Exhibition which celebrates its 250 anniversary this year. 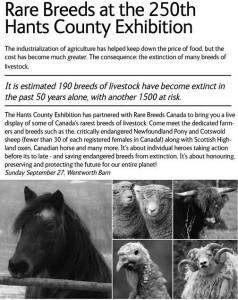 Be sure to come and join them as they celebrate the 250th Anniversary of the Hants County Exhibition in September. The first weekend is Sept 18 – 21st and the following weekend Sept 25th – 27th. 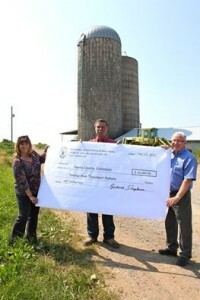 Windsor Agricultural Society President Brian Casey (on the right) is being presented a cheque from the Warden of the Municipality of the County of Kings Diana Brothers (center) on the occasion of the Hants County Exhibition’s 250th Anniversary. The Exhibition in turn is presenting Warden Brothers with a print of the Susan Sweet painting commissioned to celebrate the Anniversary. The Municipality of the County of Kings is a Silver Cup Sponsor and the Board of Directors of the Hants County Exhibition would like to thanks Kings County for their generous donation!! 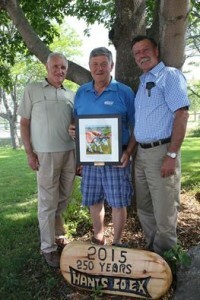 Also shown in the photo is David Logie (on the left), President of the Annapolis Valley Exhibition. As reported in the Hants Journal on June 13. 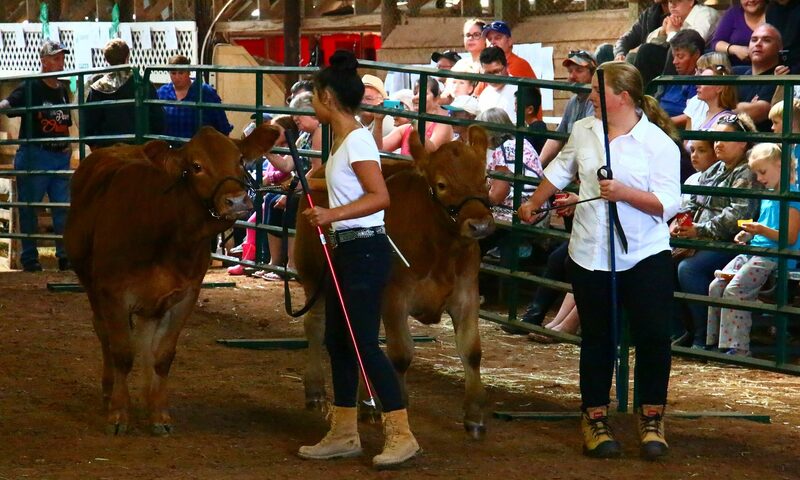 2015 the Hants County Exhibition was host to this year’s Progressive Agricultural Safety Day. With almost 300 school children attending Angus Ells, the event’s coordinator and an operations manager with the Bragg Lumber Company, said the elementary school children were learning a lot about safety too. 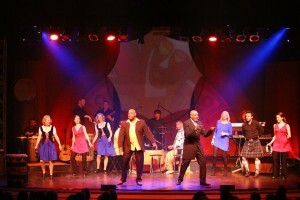 For the complete story visit this link to the Hants Journal website. 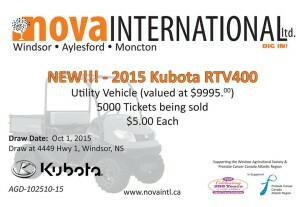 Nova International has very kindly donated a 2015 Kubota RTV400 in support of Prostate Cancer Canada and the Windsor Agricultural Society during the 250th year of the Hants County Exhibition. Tickets are just $5 are available at the exhibition office, the horse show canteen and at Nova International’s Windsor, Aylesford, and Moncton dealerships. Thank you Nova International. Dig in! This painting was created by Susan Sweet to celebrate the 250th anniversary of the Hants County Exhibition. Sweet was thrilled when approached several years ago to create a commemorative painting for the 250th.Her father Ernest Sweet was president of the Exhibition in 1965, and Sweet has a lifetime involvement and interest in the exhibition. Her practice of painting is grounded in having lived her life in rural Hants County surrounded by various aspects of agriculture. Sweet is specifically interested in our relationships and treatments of our domestic animals and livestock. 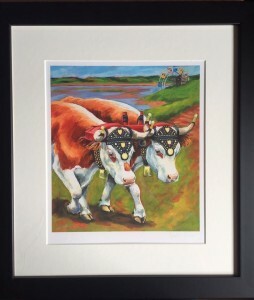 She chose oxen for this painting because they have been working the Hants County land for the 250 years of the fair. The beautiful quilted mural created by Windsor Forks District School. The artwork was displayed over the weekend at the AgArt Show in Windsor. 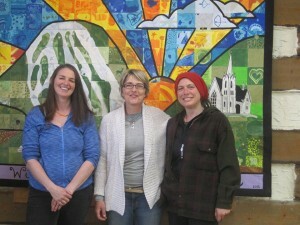 Pictured here is Lisa J Sullivan, art adviser on the project, Lisa Hines, AgArt Festival coordinator and Kimm Kent, Windsor Agriculture Society director. After three outstanding nightly performances the final audience at DRUM! 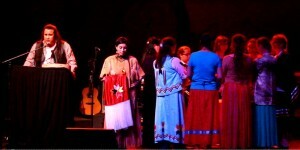 with All Nations Drum and Richard Taylor was treated to a special, culture-filled and vibrant performance . The event was undertaken by the Windsor Agricultural Society as part of its opening celebrations for the 250th Anniversary of the Hants County Exhibition. Having originally started in May 1765 the fair has continued virtually uninterrupted. 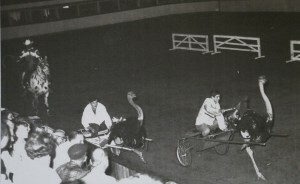 It is recognized as the oldest and longest running agricultural exhibitions in North America. 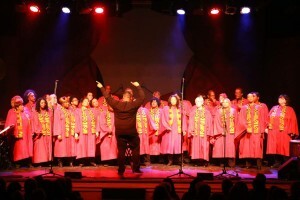 Finale of the performance at DRUM! Celebrations for the opening weekend included: four performances of DRUM! (a renowned Brookes Diamond production); an historical reenactment of the 84th Regiment of Foot Encampment; a healing drum ceremony at Windsor’s historic Fort Edward blockhouse, the oldest remaining structure in Canada; the proclamation delivery and reenactment by the Pony Express,; a weekend AgArt festival celebrating art in agriculture along with the unveiling of a commissioned painting by local artist Susan Sweet.